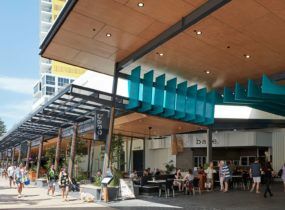 The Hilton Surfers Paradise is a subtle fusion of hotel, residential, retail and entertainment uses, inspired by the relaxed lifestyle and geographic character of the Gold Coast, creating a memorable landmark. Buchan’s vision established the project as two buildings designed to showcase strong external design features, with a vertical dialogue between the two towers. A significant height difference ensures each tower possesses its own identity. The design incorporates great arcs, which respond to the long white beaches to the east and mountain ranges the west, representing them in balanced opposition. At the ground plane, a retail thoroughfare reconnects some of the city’s vital pedestrian ways. The podium houses the foyers, restaurants, bars and café, along with the ballroom, spa, pools, gym and theatrette. Within, many aspects of the design are exceptional for this building type. The unique design of every floor allows for different spaces and a changing experience for residents and guests throughout. The floor designs also respond to aspect and solar access, protecting apartments from the western sun while providing views to the hinterland and ocean.